Marchionne says Chrysler can have everything Fiat has. Fiat S.p.A. will not be able to reach an operating margin of 7 percent to 7.7 percent targeted by sister carmaker Chrysler because Europe has not cut capacity, CEO Sergio Marchionne said. 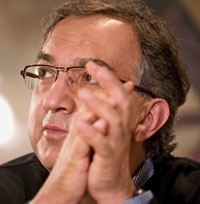 Marchionne, who leads Fiat and Chrysler, expects the two carmakers to reach 5.5 million car sales a year "certainly before 2014," with half from Chrysler, in which Fiat currently has a 20 percent stake. He said the Chrysler brand and Fiat's Lancia marque will function as one brand in the future. When you wear your Chrysler hat, you are the CEO of a private company controlled by the U.S. Treasury Department.